1. Corn – couldn’t you guess? 3. Sorghum – it’s hardier than corn, and its roots produce chemicals that kill off competing plants, how cool is that? 4. Deadly nightshade – plenty of genetic resources being developed in other Solanaceous species like tomato and potato and come on it’s DEADLY NIGHTSHADE! 5. Rhubarb – What’s not to like about a species known as “the pie plant,” and nobody’s done anything with its genetics (based on google searches for rhubarb + gene and rhubarb + genome) so I’d be in “here there be dragons” territory. Since nothing is known about the genetics of rhubarb, today’s post will instead focus on the eating of rhubarb. 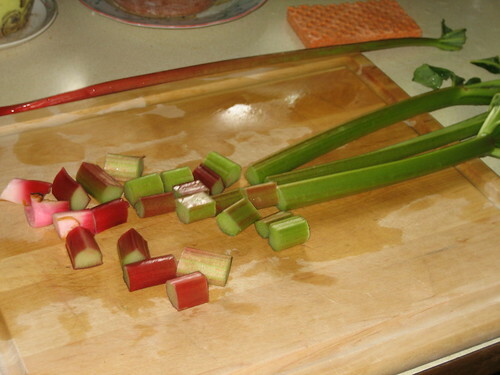 First chop your rhubarb stalks into one inch or shorter lengths. This is best done with a big knife and a fair bit of force, otherwise you won’t cut through the bottom fiberous skin. Add sugar. Lots of sugar. 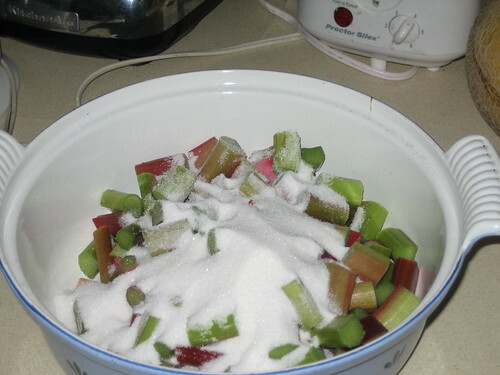 Aim for 25-35% of your rhubarb volume. What you didn’t expect me to be explaining how to make something healthy did you? 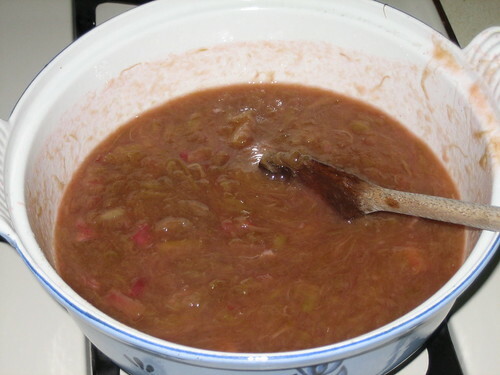 As you let the mixture of sugar and rhubarb sit, the sugar will draw moisture out of the rhubarb, which is why you don’t have to add any water. Yeah, I know it looks like Indian food, but it’s tasty and delicious in an entirely different way from how Indian food is tasty and delicious. Eat straight, or on top of ice cream, or any other way you’d like. 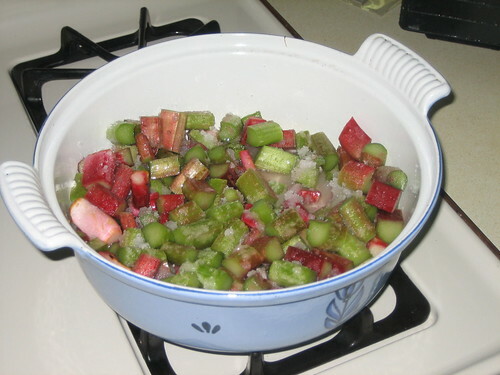 For an actual rhubarb pie the process is essentially the same. Remember to replace the pot I used with a pie crust! This post was the result of the sad discovery that there are people who’ve lived their entire lives in Iowa without tasting this delicious and enigmatic species.